Chain Bridge was the first permanent bridge between Buda and Pest. Prior to the Chain Bridge’s construction, there was a pontoon bridge from spring to autumn. As the crossing was not always possible people got oftentimes stuck on one side. Count Istvan Szechenyi got stuck on Buda side and he had to wait one week to get to his father’s funeral. 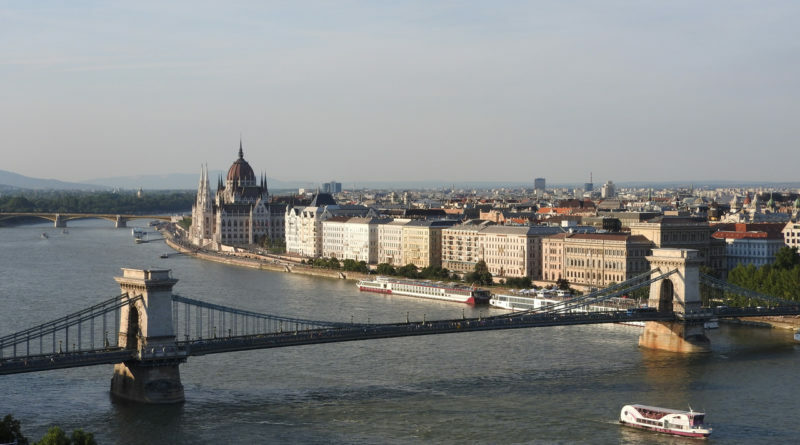 This was one of his reasons to urge the bridge building between Buda and Pest. Buda Castle offers a stunning view of Chain Bridge and the city. Funicular tours are also available to book. At the time, Hungarian engineers did not have enough experience in building such bridges, so the project had a lot of opponents. They were afraid of the sinking of the bases, the possible collapses, floods and drift ice. Szechenyi joined Gyorgy Sina and they invited William Tierney Clark to Budapest. He was the engineer, who designed the first suspension bridge to span the River Thames in London. The foundation stone has been placed by Archduke Joseph, Palatine of Hungary on August 24, 1842, in the presence of the country’s prestige. The bridge designed in sections and shipped from the United Kingdom to Hungary for the final construction. At the time, Lanchid’s center span of 202 meters (663 ft) was one of the largest in the world. In the summer of 1848, a trailing edge of the twisting element fell apart and swept Szechenyi and some workers into the Danube. He was able to swim out safety, but a worker died. The 1848 Hungarian revolution has baulked the construction. After the revolution has Hungary has surrendered on Aug 13, 1949, the Austrian General Haynau has inaugurated the bridge in Nov 20, 1849 (he was the general who has sent the nation’s rebels to death). In May 1849, at the siege of Buda, Imperial General Hentzi wanted to blow up the bridge, but fortunately, he did not succeed. The bridge was inaugurated on November 20, 1849. Szechenyi, who made the most of his building, never went walked through it – he was already living in the Drobling Nerve Institute. The bridge has received the lions at each of the abutments in 1852, the stone lions were carved by Janos Marschalko. When Buda and Pest were united in 1873 Chain Bridge symbolised Budapest as one city and Hungary. In World War II, the Germans exploded the bridge and the bomb caused huge damage. Chain Bridge has been renovated and opened again in 1949. Since then it is renovated regularly. Most of the Budapest River Cruises depart from docks near the Pest side of Chain Bridge. Enjoy the fantastic views of Budapest from the Budapest Wine Tasting Cruise, running several times a day throughout the year.